Water levels dropped even further on the Moy during the week and the dry and sunny weather also impacted negatively on angling. As a consequence, most fisheries recorded fewer catches than previously. However, the Moy Fishery had its best week of the season, so far. A total of 10 fish were caught by anglers. The Weir Pool produced five salmon including a 5.5 lbs. fish for Michael Bothwell from Northern Ireland. Also on the Weir Pool, Freddie Duncalf, Wales, had 4 fish (one released) on fly best at 6.5 lbs. Freddie Duncalf, Wales, releasing a small grilse on the Weir Pool. On the Cathedral Beat, Michael Bothwell scored again with a small grilse, while Lars Friebertshauser from Germany had two fine fish also on fly. Lars Friebertshauser, Germany, with two nice Cathedral Beat salmon. Billy Brett from Athlone was successful on the Ballina Salmon Anglers' water catching a 9 lbs. fish on worm. On Armstrong's, Paddy Reynolds, Longford, also had a nine pounder on worm. Cloongee produced 3 fish between 3 lbs. and 5 lbs. for French angler, Jean Paul Martin, spinning, while Przemek Grochowski had fish of 5 lbs., 7 lbs. & 9 lbs. on bubble & fly. 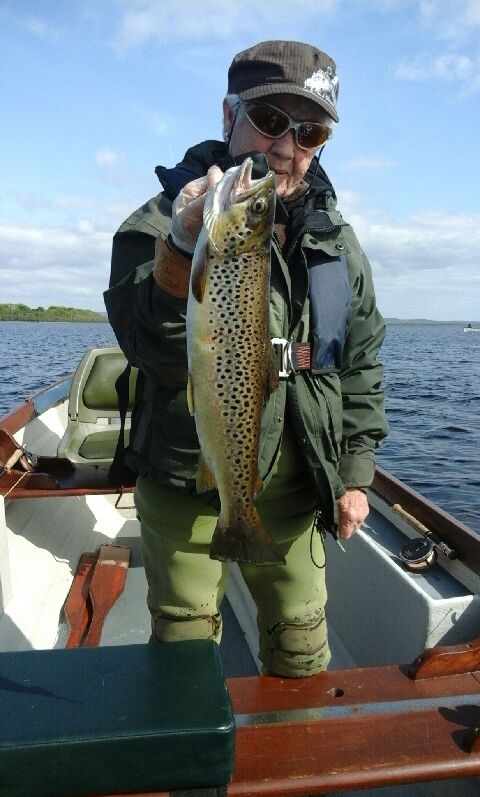 Austrian visitor, Gunter Profanter did well on East Mayo catching 2 fish at 6 lbs. and 6.5 lbs. on fly. Also on East Mayo, Martin Parker, UK, had a nine pounder on fly, while Walter Posselt, Germany, laded a 7 lbs. fish on worm. Luke O'Connell from Ballisodare Angling Club reports that 39 salmon were caught last week between May 23rd - May 29th on the river. Following a small fresh at the start of the week there were a few fish on Monday and Tuesday but low water saw the catches drop until the weekend with most fish caught at the Falls. Monday May 23rd - with fresh water still in the river from the previous fall of rain on Friday the fish were active with 6 caught. Successful anglers upriver were Paul McMahon (5 lbs. on worm) and Bernard Harte and Noel Barber who released 5 lbs. fish on the fly. Three fish were caught at the Falls, best fish 7 lbs. on the worm caught by Jimmy Mulcahy. Tuesday May 24th - Noel McKeever and Paddy McGee both had 6 lbs. fish on the worm, while John Donohue had a 6 lbs. fish on the fly, all at the Falls. Visiting anglers Damien Kelly and Mark Crawford fished upriver, catching fish of 7 lbs. and 5 lbs. respectively. Wednesday May 25th - just 3 fish for the day; Ricky Fabozzi had a fish of 5 lbs. on the fly at the Falls, while Michael Breslin had a fish 6 lbs. on the fly upriver and Bernard McKeon landed a fish of 5 lbs. on the worm also upriver. Thursday May 26th - four caught for the day; three at the Falls and one upriver. Frank Adams had the fish upriver, a fish of 4 lbs. on the worm. At the Falls, Richard Daly had a 5 lbs. fish on the prawn, Joe Martin landed a five pounder on the fly and Andrew Pearson released an 8 lbs. fish on the fly. Friday May 27th - with the water very low upriver all fishing took place at the Falls. Martin Birdie had a 6 lbs. fish on the worm; Dermot Glennon caught a 7 lbs. salmon on the prawn while Andrew Pearson released two fish on the fly of approximately 5 lbs. and 4 lbs. Saturday May 28th - Seven fish were caught for the day all at the Falls. Hubert Henry released a small grilse and then went on to catch a fish of 5 lbs. both on fly. Visiting angler Danny Irvine released two small grilse fish of 3 lbs. & 4 lbs. on the prawn, Michael Kitchen had a 3 lbs. 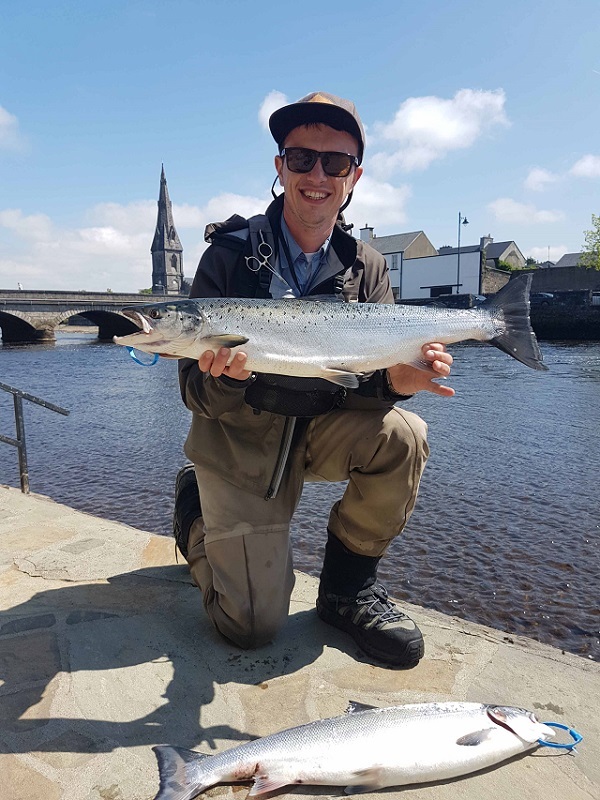 fish on the worm, juvenile angler, Cathal Galvin, also had a nice grilse on the worm while French visitor Frederick caught a four pounder on the worm. Sunday May 29th - Sunday fished well at the Falls with 9 fish caught for the day, anyone who fished managed to catch. Two were caught on the worm by Dean Wilson and Paul McCaughey (both 4 lbs.) while the rest were taken on the fly. Derek McKendry had great sport releasing a 9 lbs. salmon then going on to catch a 7 lbs. fish, Andrew Pearson released a five pounder and caught another fish of the same size, while visiting anglers Frederick Rollin and Alain Colonvan from France and Belgium both released fish on the fly of 6 lbs. and 3 lbs. respectively. It has been a fantastic fortnight on both Loughs Conn & Cullin as the Mayfly continues to bring fish up. Following an impressive performance in early May, which saw some great results on both lakes in the long established early season competitions, the trout angling action continued to improve with some fine fish reported and anglers praising the numbers of quality fish to be seen. There has also been some excellent evening fishing to spent gnat around Castle Island and in Tolan's Bay. The weather has been bright and sunny for most of the period but despite these less than ideal conditions, angling returns have been excellent during the day and great in the evening as well. 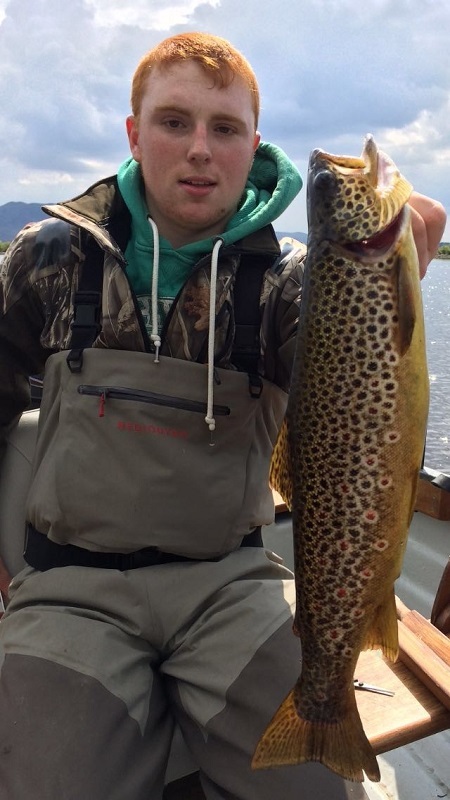 Lough Cullin produced some great dry fly action with Frankie Brannigan from Castleblaney, Co. Monaghan reporting 3 trout averaging 1.5 lbs from Simons Bay, all on a green fanwing mayfly. Numerous smaller fish were also caught and released. Also on Cullin, Steven Cassidy from Cavan had 5 trout to about 6 lbs. on an orange rib mayfly along the Dance-Hall Shore. Back on Conn, Dominic McGowan and Shane Ganly had some excellent angling in the 3rd week of May accounting for some fine fish averaging 1.5 to 2 lbs. Shane also had a beauty of about 4.5 lbs. Ferghal Reape had 13 sizable trout over the last week of May including a lovely 4.5 lbs. beauty on a Grey Wulff. Ferghal also had numerous smaller ones, which were returned. Ferghal Reape from Knockmore (who also had an 8 lbs. trout in February) with a beautiful "gillaroo type" trout of 4.5 lbs. from Lough Conn.
Richard Donnelly had some nice fish to 1.5 lbs. in Bog Bay all on spent gnat. Trevor Greene from Co. Down also had some good sport to spent, also in Bog Bay. Freddie Canavan and Michael Cawley from Crossmolina had good fishing with Royal and Grey Wulff patterns accounting for five fish over 1.5 lbs. in the Massbrook area. Eamonn Kelly from Dublin had four good fish to 2 lbs. 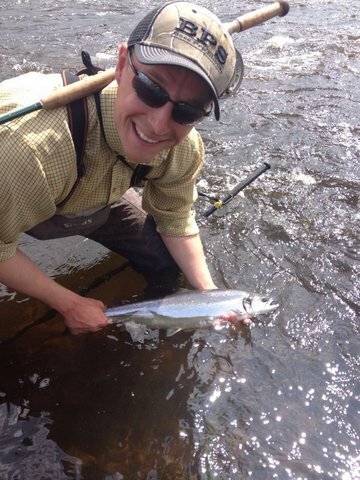 on dry fanwing mayflies, mainly in the Castlehill area and Colm Mc Andrew Lahardane had 3 fish averaging 1.5 lbs. from Victoria Bay. On the Eastern side of the lake, Kay McBride from Dublin had a lovely 2.5 lbs. trout at the mouth of the Deel and Declan Rutledge from Australia had 3 trout for 5 lbs. on a Green Peter. Gordon Peppard from London had 4 trout in the Cloghans area, all to a dry golden olive patterns. Mark and Martin Wilson fishing out of Cloonamoyne Fishery with Ian Wise caught 28 trout for their week mostly on dry Mayflies. They had 13 "keepers" and 3 fish up to 2 lbs. and many over the pound mark. They also caught a nice seatrout on a spent in Tolan's Bay and returned all their fish bar one. Nick Price and John Dickson from Edinburgh had 7 trout for three days with John catching his first Irish brown trout. Tom Dunn and Henry Walsh from Wicklow had 6 trout for about 9 lbs. on fanwing mayflies in the Massbrook area, all were released. Robert O'Dea and James Daly from Cork City had 10 good trout averaging 1.5 lbs. Dry Mosley Mayflies seemed to be the most successful pattern for them and all fish were caught in the Victoria Bay area. John and Andrew Woods from Galway had 4 trout to 6 lbs. at Coleman's Shallows. They also had about 10 trout to 13 inches, all were released. John Joyce also from Galway had 3 nice trout on a Royal Wulff around Poteen Island. The excellent fishing continued on Lough Arrow during the past week with good numbers of anglers venturing out. Several nice trout up to 5 lbs. were caught mostly on spent gnat patterns. Simon Steel, Boyle, had seven fish for the week (6 returned) averaging 1.5 lbs. on Spent and Grey Wulff. John Gorman boated a great trout weighing 4.25 lbs. on spent.